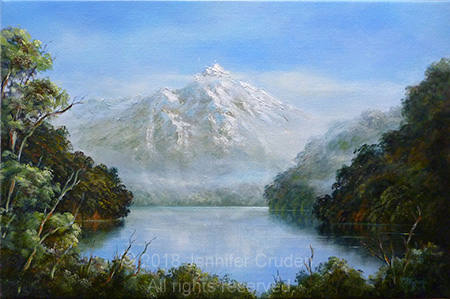 Jennifer Cruden painter in oils of New Zealand. Loving to paint with oils both in the studio and en plein air as well as contemporary art with resin. Paintings are intended to take the viewer to a world away from today's fast and complex environment. All images/designs displayed on this site are copyright to myself - no reproduction in any way whatsoever is allowed. If you wish to use in any way, please contact me to discuss. Thank you.